The COSMO-SkyMed system is a constellation of four radar satellites for Earth observation for dual (civil and military) use. Its purpose is to monitor the globe for the sake of emergency prevention (management of environmental risks), strategy (defence and national security), and scientific and commercial purposes, providing data on a global scale. COSMO-SkyMed is at the forefront of global technology and uses high-resolution radar to observe the Earth day or night, regardless of weather conditions. The fourth satelite was laucnhed on November 5, 2010, and the complete constellation is now operational. Multi-polarimetric and multi-temporal capabilities enable many civilian and advanced defence applications. 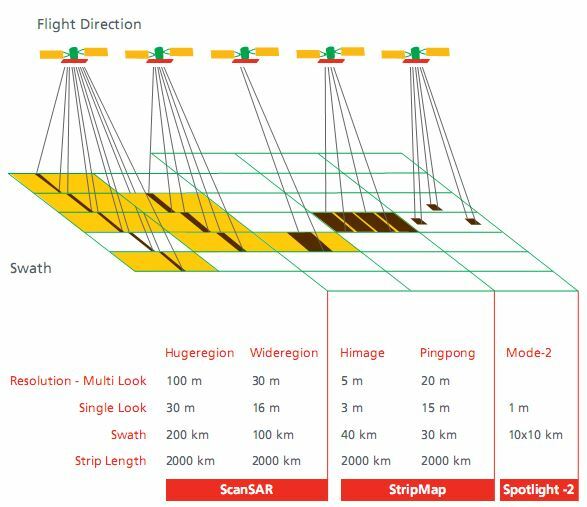 The sensor can acquire images of the earth in ScanSAR mode (large coverage with a medium to coarse spatial resolution) or in Stripmap mode (medium coverage with a fine resolution) or Spotlight mode (small coverage with metric resolution). 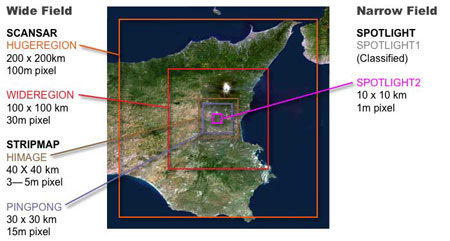 One of the best performances of COSMO-SkyMed system is the capability to carry out very accurate measurements based on phase signal (Interferometry) by using indifferently the satellites of the constellation. This guarantees a huge choice in terms of time intervals for change detection and coherence analysis (starting from 1 day intervals) and at the same time provides unprecedented revisit for applications based on the collection of a long time series of images.